RALEIGH, NC (WTVD) -- It's a bittersweet day for Wolfpack fans as junior running back Nyheim Hines announced he will declare for the 2018 NFL Draft. The Garner native is a first-team all-ACC choice at running back and third-team at specialist. He averaged 143.7 all-purpose yards per game in 2017 for NC State. He led the ACC and ranked fifth among power-conference players. "We appreciate Nyheim's contributions to the entire athletic program as a multisport athlete," said head coach Dave Doeren. "He could've played college football anywhere in the country, but he chose to stay home and come to NC State. He has made an impact on and off the football field." 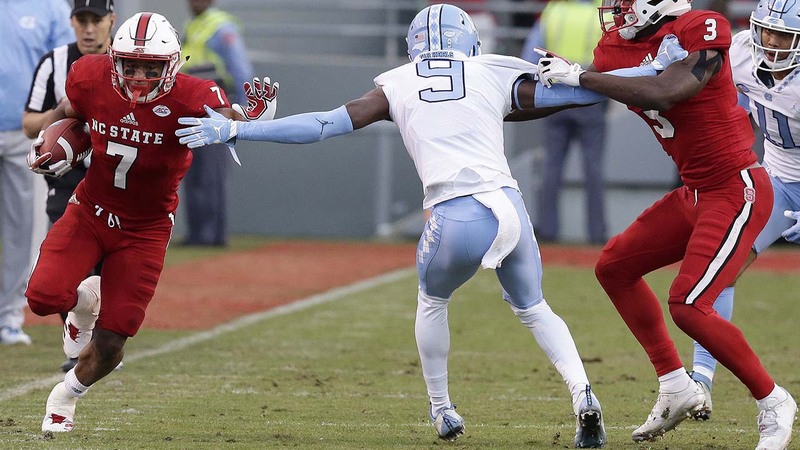 Hines ran for 1,112 yards and 12 touchdowns last season for the 9-4 Wolfpack. "I would like to thank the coaches for believing in me and giving me the opportunity to play at my dream school," Hines said. "I appreciate everybody at NC State who has helped me along the way. Last, but not least, I want to thank Wolfpack Nation for always supporting me - even in high school - to help make my dream come true. NC State will always be a part of me wherever I am in life, and I will always be drawn back here." Hines was also a Wolfpack track star. He was an ACC champion and all-American running the leadoff leg for the school's 4x100-meter relay team. He also was ALL-ACC in the 100- and 60-meter events. The school said that Hines plans to return to NC State to finish his degree.